PLEASE NOTE: I am travelling out of the country from 5 Dec 2018 and so will be away from this bookshop. You can order digital products and services anytime but the physical books will be unavailable until my return. The final part of THE TROUT TRILOGY is now completed and will be published in June 2019. 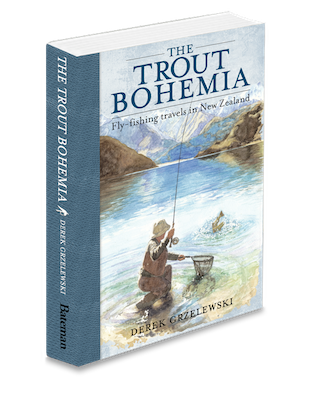 “In the years since writing his second book, The Trout Bohemia, Derek Grzelewski has returned to guiding, sharing his passion and secrets for fly fishing with enthusiastic anglers from around the world. But his life is about to change when one of those anglers turns out to be ‘a Colorado girl who just loves to fly fish’. They strike up a long-distance relationship, and Jennifer soon flies out to New Zealand to join Derek for a season of fly fishing — an experience that will transform their approach to life and trout fishing forever. 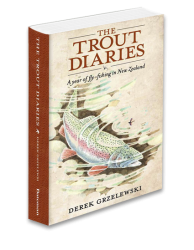 With Jennifer’s fly casting technique best self-described as ‘punk rock’, Derek has his work cut out for him, to rapidly elevate her skills to meet the formidable challenges of fly fishing for large wild trout in New Zealand’s ultra-clear waters. 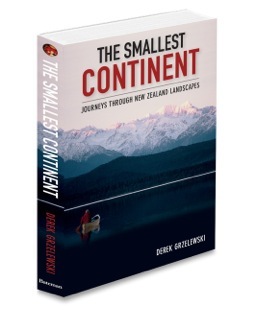 A collection of my stories from travels through New Zealand landscapes. Kaikoura, Banks Peninsula, ceramic arts, Charlie Douglas, West Coast pioneering aviation, Huskies, Mountain Biking, Gold, Catlins, Otago and more. The meaning of New Zealand landscapes and their influence on us. 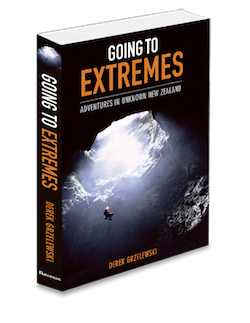 Collection of my best non-fishing stories: climbing, cave diving, saving kakapo and kiwi, pioneering aviation and scuba diving for sunken treasures, epic journeys, ultra-running, lichens, avalanches, fire-fighting and more. Recorded live at the 2015 New Zealand Mountain Film Festival in Wanaka. Nearly 4 hours of practical how-to information to transform your own writing, how to make your stories stand out, how to captivate your readers and hold their attention. No theory here, but plenty of hard-earned tips from my 20 plus years in the publishing industry. 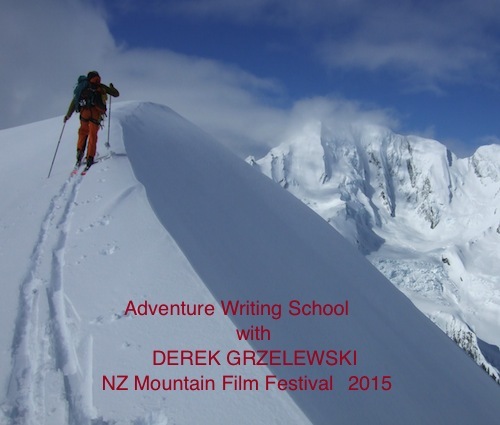 2-hour writing seminar recorded live at the 2014 New Zealand Mountain Film Festival in Wanaka. The secrets of structures, suspense, engaging the readers and holding their attention. No theories, only solid, hands-on but informal advice from the acclaimed adventure writer. 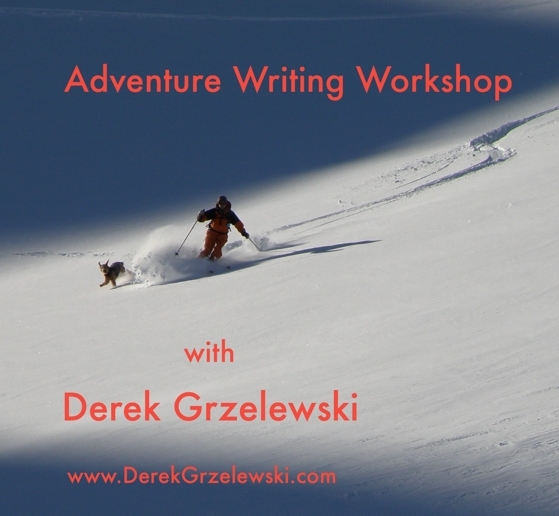 Whether you are writing magazine articles, fiction or non-fiction books, or film scripts, you will benefit from Derek’s universal insights into story telling distilled from 20 years of full-time writing. I have nearly 25 years’ experience in magazine and publishing industries and have worked with some of the best and biggest magazines in the world. If you have writing projects of your own and need help and guidance get in touch to save yourself a lot of time, money and potential dead-ends. The road is too hard to walk it alone!